To a person, Neil Alden Miner was remembered fondly for his devotion to his career, his family and friends, and his students. Born at Saranac Lake, NY, Miner became an avid student of the outdoors at the knee of his taxidermist father. He began his studies at Syracuse University in 1917, where his association with Dr. Charles H. Richardson, Head of the Department of Mineralogy, led to a summer of field work with the Vermont Geological Survey and a lifetime commitment to geology. Although family circumstances did not allow him to complete his bachelor's degree until 1932, he earned his master's at Syracuse in 1934 and his Ph.D. at the State University of Iowa in 1937. 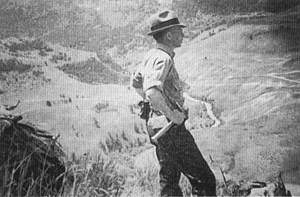 While doing field work for his dissertation on Pleistocene glaciation in areas of Yellowstone National Park, Miner worked as a ranger-naturalist. His unusually popular campfire talks on the geology and wildlife of Yellowstone were renowned for their clarity, scientific accuracy, and enthusiastic presentation. 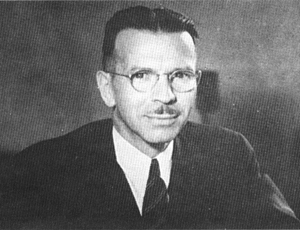 Miner began his career as an educator at Cornell College in Mount Vernon, Iowa, in 1937 as Chair of the Geology Department. His leadership in both college and community educational activities over the next 10 years attested to his strong respect and affection for students and earned him reciprocal respect and affection from the communities he served. Aside from his contributions to geological science through the professional lives of his students, Miner's most important accomplishments included establishing Camp Norton, a summer geology field camp for students at Cornell College, Knox College, Syracuse University, and Miami University of Ohio in 1940, and organizing the Association of Geology Teachers in 1938, which has evolved into our National Association of Geoscience Teachers (NAGT). From a seminal group of five geology teachers interested in getting better acquainted and exchanging teaching ideas, the NAGT has grown into a North American professional organization that fosters understanding of the importance of the earth sciences and encourages excellence in geoscience teaching. Tragically, leukemia ended Neil Miner's life prematurely in 1947. Officers of the NAGT established the Neil Miner Award in 1952. The prestigious award is given in Miner's memory each year to honor him for his contagious enthusiasm for geology and unselfish dedication to his students and his profession. Each year, the NAGT presents the Neil Miner Award to an individual for exceptional contributions to the stimulation of interest in the Earth sciences. The Award, presented each year since 1953, commemorates Neil Miner's concern for personal excellence and effective teaching. His ideals, his notably unselfish outlook on life, and his personal philosophy inspired his fellow teachers as well as his students. The Neil Miner Award is presented annually at the NAGT luncheon held during the national meeting of the Geological Society of America. a letter of nomination stating why the nominee is an outstanding geoscience teacher. up to a maximum of four letters of support no more than two pages in length. At least one letter each should come from a student, a colleague, and an administrator. All letters must be written specifically for the Neil Miner Award nomination. The award winner is chosen by a committee consisting of the President of the Association, who serves as Chair; the immediate Past-President; the Secretary/treasurer; and two members recommended by the Executive Committee. Nominations not selected for the award will be considered for two subsequent years. Nomination Deadline is April 1.